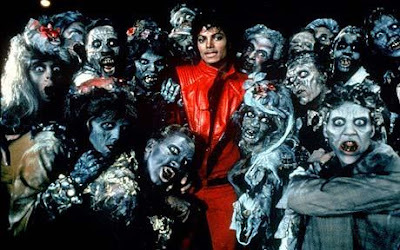 Join the worldwide record attempt for the most people dancing simultaneous to Michael Jackson's "Thriller." Over 300 locations all over the world from Netherlands to Peru will participate on Saturday, October 24th at exactly 5:30pm (Pacific Coast Time). To participate in this once in a lifetime event, check in with the "Thrill the World" website. All dancers must know the steps exactly as shown in the demonstration video. Remember, the dance occurs EXACTLY at 5:30pm on Saturday, October 24th. Zombie costumes encouraged! See the list of registered cities here or start your own! To register for the Bay Area event click here. p.s. how much do we love the internet for making this possible??!! I got lost after a couple minutes. I guess we'll just watch rather than participate!